After 5 months of hard work, the Amarok team is proud to present the next major version of Amarok, 2.1. When Amarok 2.0 was released, we celebrated the first of many steps along what will be a long series of Amarok 2.x releases. The 2.0 release brought with it an entirely new foundation to build on, and a developer team more motivated than ever to make Amarok 2 the best music player possible. While Amarok 2.0 contained many new features and ideas, it was also lacking many features that users of the previous, very successful, versions of Amarok had come to expect. With the release of Amarok 2.1 we are not only starting to close this gap, but we are also introducing a number of new and unique features that will make your music listening experience even better. 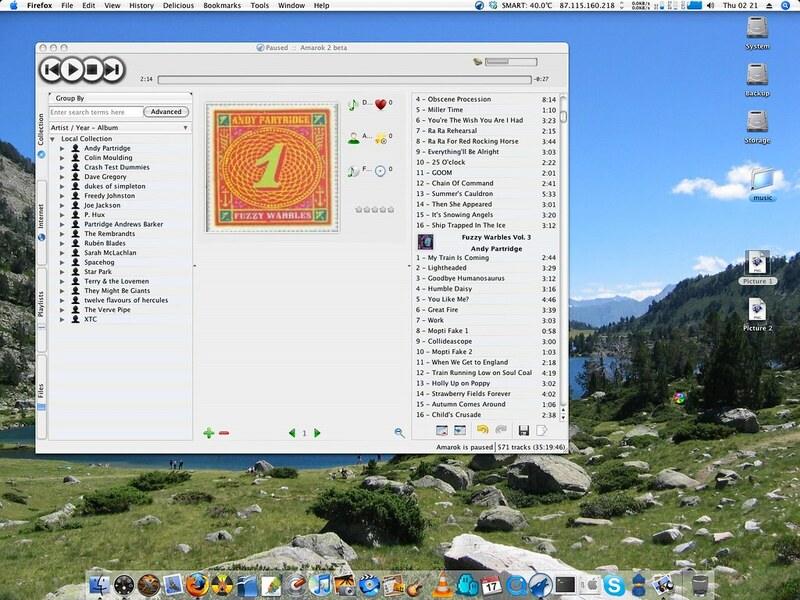 The playlist in Amarok 2.1 has undergone many improvements since the last release. You can now search and filter its content and queue tracks as well as tell Amarok to stop playing after a certain track. The biggest change however is the new playlist layout editor. It lets you make the playlist look the way you like it. Covers, ratings, genres or just a simple track name? It's up to you! It comes with a few layouts predefined and leaves the rest for your creativity! The improved Context View comes with a new layout and makes better use of free space. Applet management has been improved and applets follow your KDE color scheme. Instead of using multiple pages with applets, new Context View displays them in one vertical column which can be reorganized with a handy widget at the bottom. Bookmarking is finally here! Bookmarking comes in two types, automatic and manual. When you are listening to a long podcast, audiobook (or any other track longer than 10 minutes) Amarok will automatically mark the last listened to position and auto resume playback when you return to the track. You can also manually bookmark a position in any track to save for later. Amarok URLs allow you to create a link to a certain place in Amarok. For example, you could make an URL to a great song you found on Jamendo and send it to your friend. Her Amarok will open the Jamendo service and the song you found. Stumbled upon an exceptional audio book on LibriVox? Create a link and send it to your family. In this release we are just starting to explore what is possible using these URLs, so expect to see many interesting features based on this in the future. Amarok now supports ReplayGain natively. When it is enabled Amarok equalizes the volume of songs with ReplayGain tags to avoid big unexpected volume changes between songs. It currently requires the GStreamer Phonon backend. Headers in the collection browser now have a much cleaner, more distinctive look. Album cover support for iPods has been added and many bugs have been fixed. There's no need to leave Amarok in order to change the system-wide sound settings anymore. The Phonon configuration can now be opened from Amarok's preference dialog. This is especially handy when using Amarok in other desktop environments and operating systems. Grab your copy of Amarok 2.1 today and rediscover music! You can find videos of some of the above mentioned features in our YouTube account. If you want to find out what we are working on for Amarok 2.2 and beyond, check our blog posts on our Planet. Haven't grabbed the final release yet, but I've been using the last beta for a few days now and I'm happy to say virtually all usability issues and regressions in 2.x are gone, allowing its advancements over 1.x to come to the fore and finally make it conclusively better. I'd been playing music app chairs between Amarok, XMMS2, and MPD for a long time now, and it appears I'll keeping mainly with Amarok until XMMS2's Summer of Code project hopefully result in a worthy GUI client and then I'll re-evaluate things. The context pane is so much more useful now with its system of "jump scrolling" and more readable aesthetics. Though I wish the dev's would add a "last x songs" panel though, similar to what is displayed (IIRC) in current song pane if you aren't playing anything. This would make it easy to rate/tag/last.fm love tracks after the fact, especially when you're using a dynamic playlist that crops off played items. I suppose one can create his own context modules but I haven't looked into that. Great work, devs. Very curious to see what the next big features will be. oh wait, it isnt, i will have to wait weeks again until ubuntu updates the repositories. why is there no simple deb file available for download? The previous poster pointed out that it was posted on the Kubuntu home page. That IS the official site. Congratulations for this release and for all these new features ! Amarok 2.1 would be perfect if there wasn't a collection import bug : I haven't any ratings imported from Amarok 1.4. Any idea ? It's also linked from the official Amarok download page, fwiw. What is it with snobby users?? You can copy/paste the same answer, but it's not likely to do people having problems any good. I'm still waiting on some features that I can't live without on amarok 1.4.10 such as Firefly/Itunes streaming support, MySQL and various scripts to catch up. They haven't updated that DMG for a year. You're running pre-2.0 beta, not 2.1 stable. COME ON GUYS! I really would like a new DMG. Great work! Much more to come I'm sure! Looking very good, guys. Keep up the good work! I'm still staying with 1.4 for now though, for I am much too dependent upon labels for my own good. Once those are re-implemented, I'll switch completely over in a jif! Until then, though, I'll still keep checking out the progress, of which there has been much! "Let There Be Light" indeed. I agree with Stephen -- it looks like great things are happening and fast! I too am too dependent on labels in 1.x (my whole collection is meticulously labeled, my playlists are all smart playlists based on labels, etc), so I can't switch over until they're back -- but I look forward to that day with anticipation! I absolutely agree, though I would add that I need label support and the possibility to import them from my old collection. I'm using the new amarok most of the time already but that way I'm stuck to my current playlist and can't really use my whole collection. So I haven't fully made the switch. Amarok 2 keeps getting better though. There are more work to do, but thanks! Thanks for this new version. Now I go from Amarok 1.4 to Amarok 2.1 (from beta). It's a really good work; but I have too many problems. For example, if Amarok 2.1 crash (frecuently :-( ) I lost all the changes from this session (podcats downloaded, last playlists, etc). Another question is "How I can Add my music into my iPod?". I don't know why i can't drag a music into the media device and I can't drop it. I use Kubuntu 9.04, and my Amarok 2.1 FINAL is from the official deb Kubuntu's repo. Can someone help me with this? I also really like Amarok (I'm using the SVN version by the way), but I think this release comes too early. Shouldn't at least the absolutely annoying collection bug (https://bugs.kde.org/show_bug.cgi?id=178973) have been fixed? I'm not the only one who constantly has a messed up collection and needs to delete the whole MySQL-db over and over again. Not really. I still get no covers for all my comps. Althought I've got both an embedded cover for every mp3 file as well a cover.jpg in every album folder. This is a bit disappointing. Otherwise, great work. Keep on rocking guys! Yep, no embedded cover but a cover.jpg file in compilations folder like you and no cover automatically set for any of them after scannings. However scannings are now much sanier than in 2.0.2, I don't have any other issue for now, what a relief, thanks devs! Fixed it for me such that I could update the packages with aptitude. Even after adding the keys I never could get the gui package installer (kpackagekit) to work though. Just a quick question: is there an option to turn automatic bookmarking off? I'm thinking of audio cd bonus track here, which are sometimes longer than 10 minutes. I don't want to start listening to silence if I tune them in (I usually switch to the next song without listening to minutes of silence). Opensuse users should be careful. I just installed it and it deleted all the id3 tags from all files in my playlist. All other songs not in the playlist seem to be fine. Amarok would never modify your tags unless you explicitly order it to do this. Collection scanning is a pure read-only operation. Maybe your tags just appear invisible for some reason - If you create a bug report in our bug tracker, we will look at your problem. For what it's worth, I did just try to reproduce your issue here, but everything worked normally. Dragonplayer and VLC are still able to read the id3 tags. Amarok however is not. I'll open a bug report later today. Which additional infos do you need? Happens to me too if I scan my collection with tracks currently in playlist a lot of the times, or upgrade amarok, not sure the exact conditions needed to get it to happen, but I didn't file bug report since I'm using a fairly out of date SVN build. Solution seems to be to clear the playlist, close amarok, open again and rescan, you may also need to delete the ~/.kde/apps/amarok/mysqle folder it appears before opening and rescanning. It luckily doesn't touch the files themselves, just messes up Amarok's database. By the way, there is a new truck from Volkswagen, and guess which name they are using: Amarok!!! YEAH!!!! This is so crazy!!! I want one of them!! But they are not open source, trash! i mean there's no way for me to get them back in my collection. on annother pc which uses the same audio files these 2 are in the db but other files are missing, which were in the playlist during first restart. Thats odd, because I just had that problem with 2.0 Amarok once crashed and after that the tags of the files of one folder were deleted. Definately. Opensuse users should be careful . One small note concerning this article: the link to the "appletbar" image ( http://amarok.kde.org/files/appletbar.png ) is broken. please can we see an OSX .dmg version of this? I really like the changes that you have made, but unfortunately it's way too buggy to use seriously on Ubuntu GNOME. Have to agree here. Just spent 30 minutes trying to get it to play with no luck. maybe it has something to do with the backend as I'm trying to use gstreamer rather than xine? either way it never played a sound and even crashed a few times while changing the backend settings. I was really hoping to get back to using amarok. I used and liked the kde3 version alot in the past. Ya, I think it does have to do with the backend. As far as I know, it only supports Xine, so go ahead and switch to it. If you don't have it installed, I think its the phonon-backend-xine package. I'm not going to use the new amarok until mysql database support is added. If it won't be added, I'll be switching to another player. It is as simple as that. Amarok 2 uses mysql per default (an embedded mysql server) which actually gives a huge speed improvement over sqlite on a default Amarok installation. I think what you mean is that you want to be able to connect to an external mysql server. This is definitely something we want as well, and it actually should be very simple to do as the mysql client library that we use can connect to either the embedded server or a "real" server just by changing the address. ... its just one of the things that no one has gotten around to yet. On top of what Nikolaj said: Threatening us with switching to another player does not work. We try to please our users as good as we can but this is not the way things work here. This is Free Software. You are free to choose whatever program you want and help improve it if it is lacking in your opinion. Did they get rid of that hideous "Skip-twice" bug? I'm not testing until someone can confirm me, I won't let software infuriate me again. what bug? if you mean amarok randomly skipping songs in your playlist, we've discovered that the Now Playing plasmoid (on the desktop) has managed to cause this weird behaviour. so remove that and you should be all set. Still ugly. Not that anyone is really surprised by that.